Hi Maddy, When a parent item is versioned, new relationship items are created to link the parent item with its related items. That's why the created_on date of a versioned item's relationships may match the parent item's created_on date - even if the related items were added to a previous version. 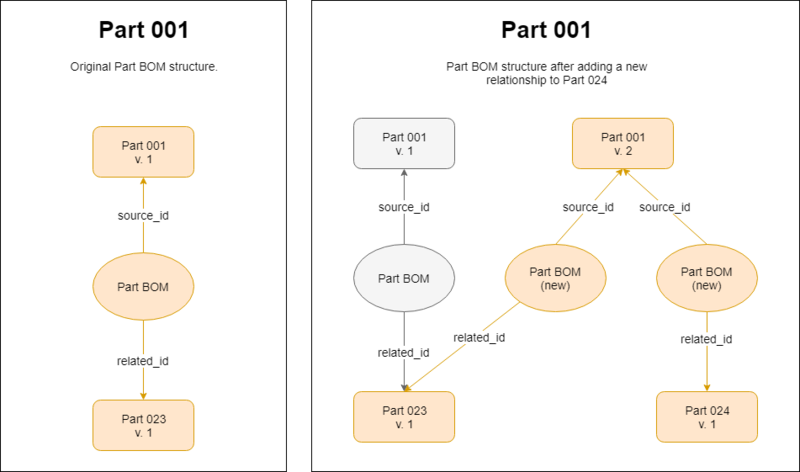 The following diagram shows how this works with the Part BOM relationship: You can see that v1 of the Part has a relationship to Part 023. When v2 of the parent Part is created, a new Part BOM relationship is added so both v1 and v2 of the parent Part can reference Part 023. Regarding your use case, there are a few options. If you want the relationship grid to show which version of the parent item was originally linked to the related item, you can use a custom field and OnInsertRow grid event. The following sample code will get the major rev and generation of the parent item and set it on the relationship's custom field. Whenever the parent is versioned, the value will be copied to the new relationship item.